Every March of every school year my classroom earns the nickname March Madness. March brings unfavorable student behaviors. Most teachers can relate. Which means I look for ways to reteach classroom procedures and model ways to act kindly and responsibly. One way I reteach is through books. My students love when I read books with special purpose or meaning. My building principal gifted me a book called, Desmond and the Very Mean Word, written by Archbishop Desmond Tutu and Doulgas Carlton Abrams. This book is impressively powerful with a great message. 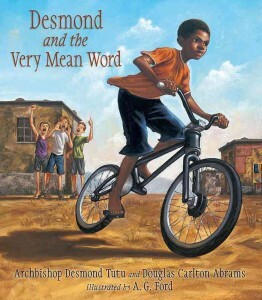 It follows little Desmond who encounters a group of white boys that seem to be bullying him. They shout a “very mean word” at him, but the book doesn’t reveal what the word actually is. Little Desmond seeks help from his priest, Father Trevor. Father Trevor tells Desmond the “secret of forgiveness.” The secret is not to expect an apology, but to expect yourself to forgive others. In doing so, you are freed from the power of any negative words or actions. These lessons are so simple and yet so powerful. I am grateful for this book and others like it that showcase how we, as human beings, are meant to treat each other. As a teacher, I’ve learned that when life starts to feel a little ‘mad,’ especially with my darling first graders, returning to simple lessons such as teaching a forgiveness narrative can have a powerful impact.